The Nakaya Piccolo Writer Small Sword Gin Itomaki is one of the most distinctive writing instruments Nakaya has produced in recent years. Many of Nakaya's special edition pens use unique combinations of technique which defy easy categorization by the traditional standards of Maki-e art. 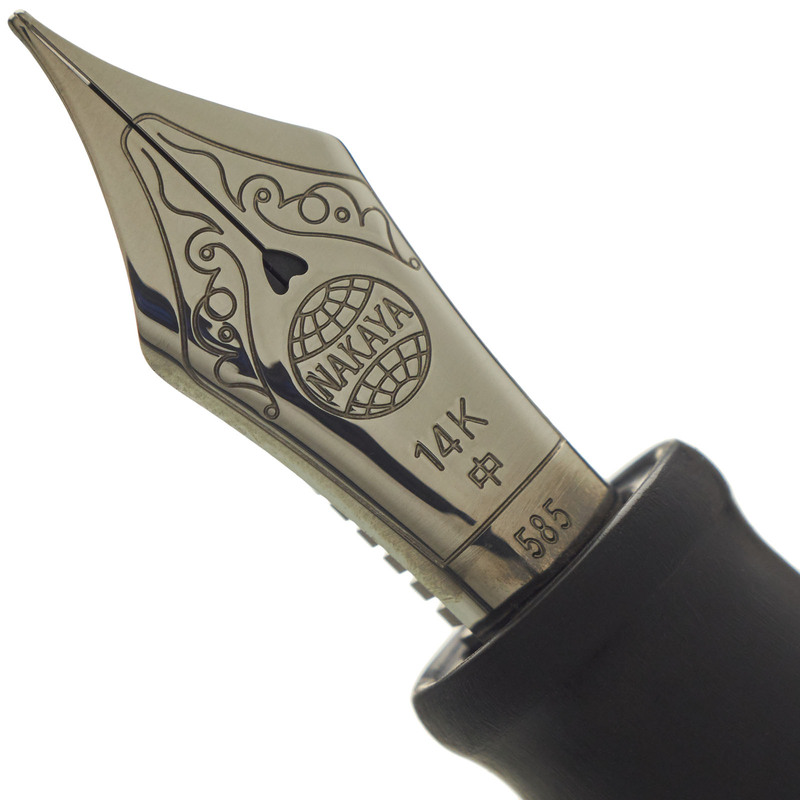 Nakaya seeks to stretch the boundaries of what can be achieved both on and with a fountain pen. "Gin" means "silver" in Japanese, and "Itomaki" translates to "handle wrap". So the techniques for making the Small Sword Gin Itomaki are in the name. The Samurai dominated Japan for 700 years, and their influence continues to permeate Japanese culture. With silver-grey painted thread wrapped around a matte hairline body, the Nakaya Piccolo Writer Small Sword Gin Itomaki fountain pen is made in the likeness of a sword that a Samurai would be proud to carry. 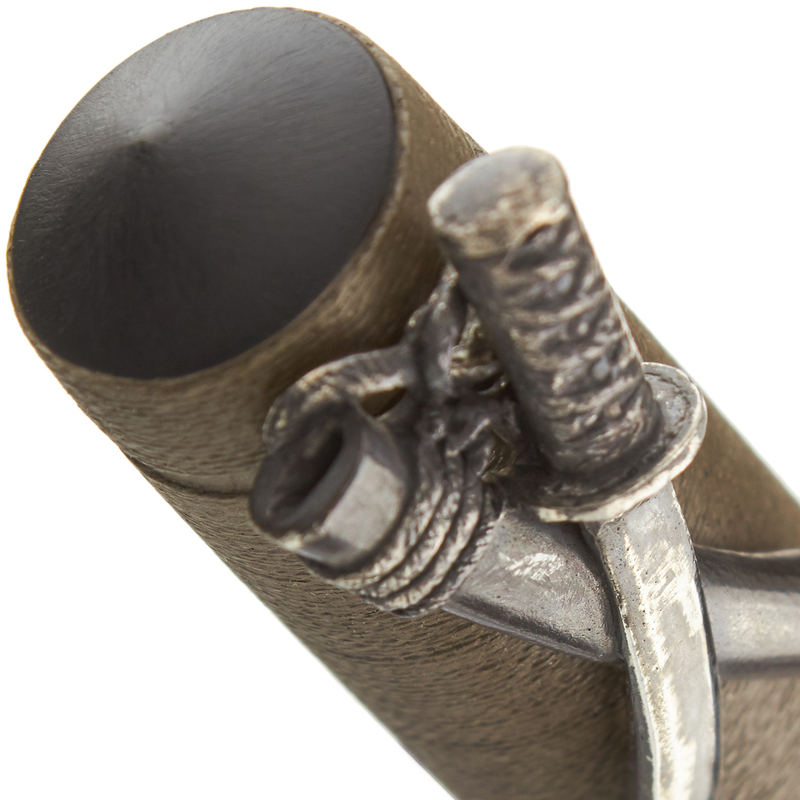 The distressed silver finish sword rolling stopper completes the battle-worthy look and also serves as a fully functional way to prevent the pen from rolling off of a table. "Gin" means "silver" in Japanese, and "Itomaki" translates to "handle wrap". Here the silver-grey silk thread wrapped around the cap and part of the barrel provides a textural delight which contrasts with the smooth matte black hairline ebonite underneath. The shorter Piccolo model fits comfortably in the hand and at a weight of 28 grams maintains a good balance. 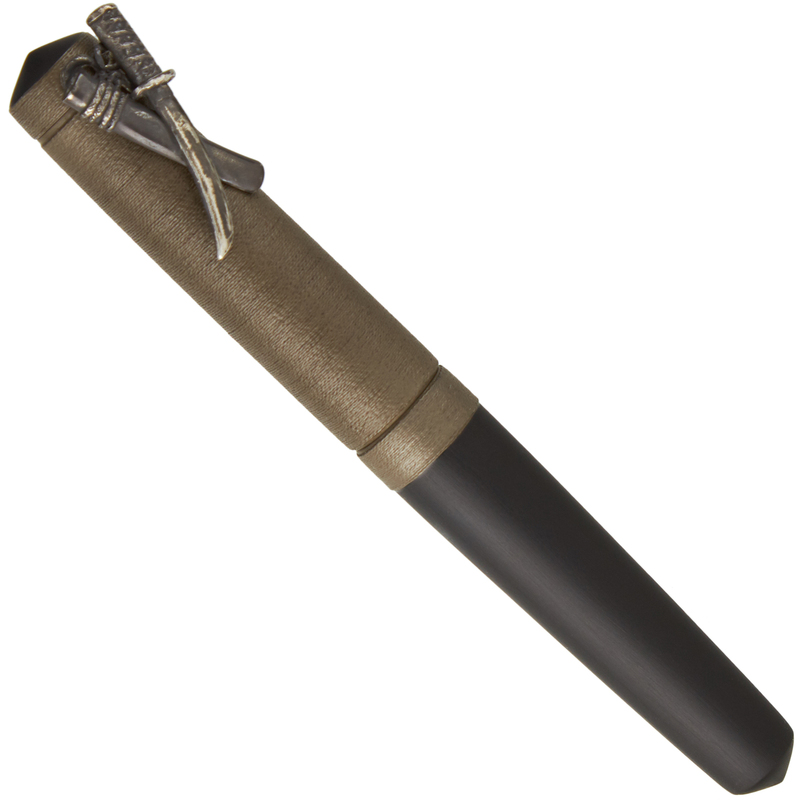 Nakaya decided to make the rolling sword roll stopper more widely available due to popular demand from customers. 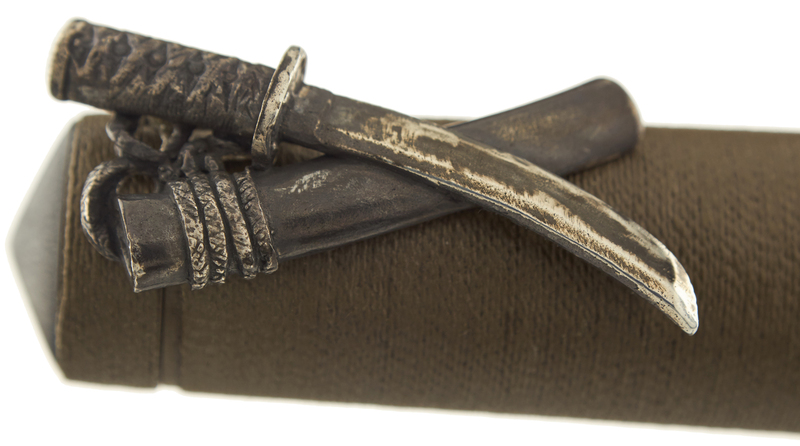 Here the silver swords are fumigated and blackened, and then the blades are polished. Over time the swords will get shinier and more of the silver will re-surface. Though two-tone nibs are also made available at added cost, a ruthenium-plated nib matches the darker metallic tones of the Piccolo Writer Small Sword Gin Itomaki and is provided at no additional charge. Nakaya pens can be filled with bottled fountain pen ink using the provided converter and can also use Platinum brand high quality ink cartridges. Hand-painted Maki-e converters are also available. Nakaya pens ship in a solid softwood shipping box decorated with Japanese Kanji script and lined with decorative rice paper. 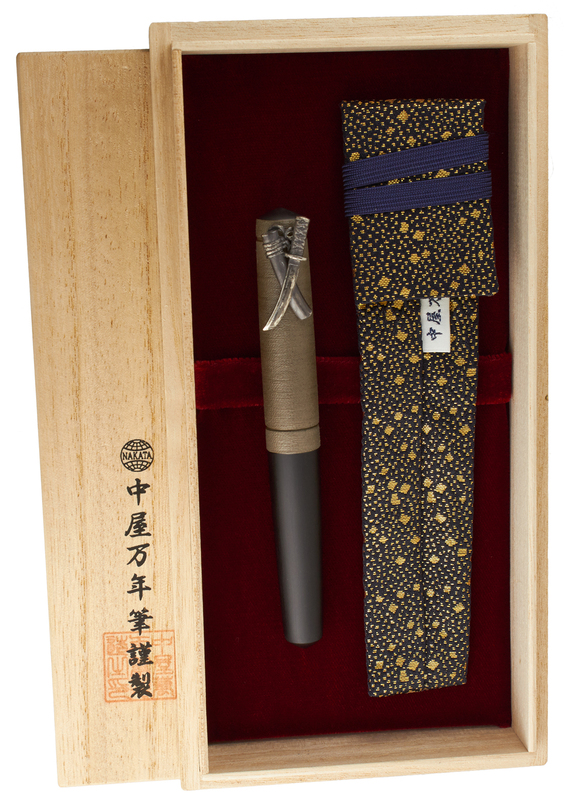 A fabric pen "kimono" and starter box of Platinum brand cartridges are also included, making this pen a lovely presentation item. Sensible and elegant packaging has long been a hallmark of the Nakaya brand. Nakaya pens are individually handcrafted in a process that requires a minimum of three to six months and often much longer. Unless requested otherwise, each pen or nib you purchase from us will be carefully examined, tested, and optimized for your personal writing characteristics before it ships. See our nib set-up and optimization page for more details.